This week, we are headed to Australia to talk to Dr. Kathryn Hodgins. 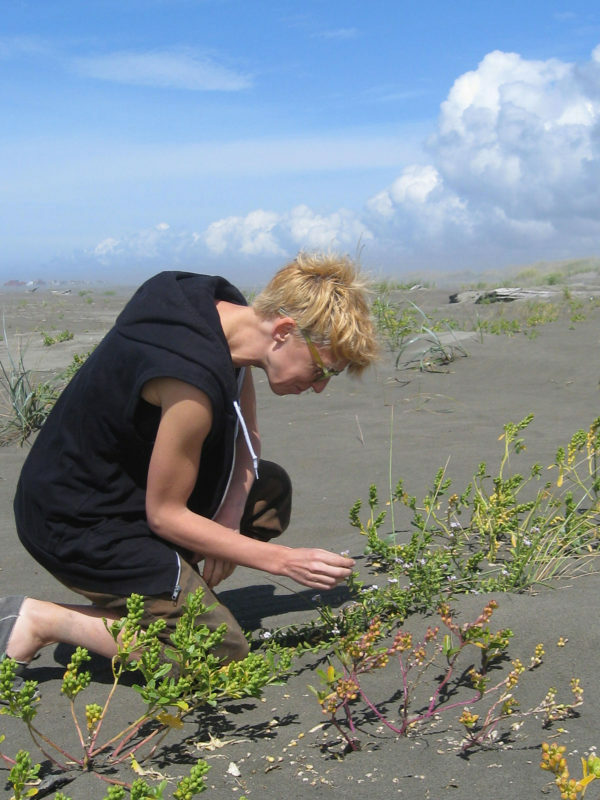 Her work focuses on understanding rapid local adaptation, especially in the context of invasive/weedy plants. I asked her how she gets it done. I study the genetic basis of adaptation in invasive and foundation plant species. I am interested in how species evolve during colonization and invasion. I am also particularly concerned with the factors that facilitate gene reuse during adaptation to similar environments. My research involves a mix of genomic data analysis, common garden experiments and field work. Try and find the best people possible. It is hard when you are first establishing a lab to find good people that you can work well with. Also, remember most students need a great deal of encouragement and help, particularly when they first start, and that your experience as a grad student might not be the same as a new student in your lab. Different students are going to need different levels of support and feedback to be successful, and the key is trying to quickly figure out how to work well with each individual. I suppose I heard all of this advice when I first started, but it is interesting to see how true it is! Finally, I recommend to find excellent mentors and listen to their advice. Dropbox. All my files on my laptop are synced with my computer at school, although I mostly work on my laptop. I routinely use R and unix (and perl). I mainly do bioinformatics analysis on clusters at Monash or lab servers. I have plans to use more cloud computing. I do most smaller scale analysis on my laptop or computer. I could live without gadgets, but my job would be much more challenging. Sequence alignments by hand would definitely take more time. Recently, I spent two weeks in China without access to any gadgets and I managed to survive, although it was touch and go at times. I actually find non-gadget time liberating and I sleep better at night when my phone isn’t near me. One gadget I love is my Garmin Fenix HR. It is a great training tool that tracks my running pace and heart rate among other things. However, I enjoy running more when I am not constantly checking my watch! It depends on the time of year. Currently I am spending most of my time teaching and writing grants. I wish I had more time for doing my own research. Below is an average estimate, but I am sure there are some cognitive biases with these estimates. I am not sure what I would do without unix one liners. I wish as a PhD student I had learned how to better manage large datasets. I spent hours fixing excel spreadsheets by hand! What a waste of time when data manipulation in unix (or R) is so fast. Also, barcode readers are a life saver for large experiments. Finally, remember the phase “measure twice cut once?” the same idea is true for code and input data. Troubleshoot and spend time making sure your code and input data is appropriate before running that giant analysis that takes two months. I think I would miss every other meeting and lecture if I didn’t use Google calendar. I just don’t know how people managed before it came along. Basically, if a meeting doesn’t make it into my calendar, there is a good chance I will miss it. When I am doing data analysis, or writing code, I often put on a podcast … that I stop listening to 10 seconds later because I am concentrating on the analysis. When I write I don’t listen to anything – except for the deafening construction noises outside my office window. Once I managed to sit through a fire alarm because I was so used to blocking out these loud construction noises and I didn’t notice that everyone else had left the building several minutes before. Sometimes I listen to dulcet tones of Tim Connallon talking about sexually antagonistic alleles in the office next to me (the walls are paper thin Tim!). I run. Spending time with friends and family is the most important activity I do to recharge. I also like to travel for fun, although after several traveling misadventures, such as recently experiencing large earthquake in China, I probably will vacation closer to home for a while. I love to read, but these days it is difficult to fit reading for fun into my busy schedule. I often listen to audiobooks and podcasts when I run. Otherwise I read scientific papers or “the internet”. My phone is very unhappy with my sleep routine and it usually gives me a rating of “poor”. This upsets my competitive nature. Seek out and work with good people.